Lampshades are often overlooked when it comes to household chores. After all, they’re out of the way for the most part and don’t encounter the same sort of spills and messy mishaps as other furniture in the house. That being said, if you neglect your lampshades year after year there’s a very good chance you’ll start noticing some signs of aging like discoloration, frayed edges, and a hard to budge build-up of dust. Here are a few tips to make sure this doesn’t happen, and keep your lampshades clean and shiny like they should be! Before you start, keep in mind that not all lamp shades are washable. If you’ve kept the care information from the manufacturer, then be sure to consult before beginning. If not, try to find the info online. Now that you know whether or not you’re good to go, we can begin! Fill your bathtub with a mixture of warm water and dishwasher detergent. If you have a large laundry sink, this will work too. Dip the lamp shade in the water, ensuring that it is completely submerged. Rinse the lamp shade following the same procedure, until the water is completely clear. Dry the lamp shade by swinging it in a circle, until there is no longer any excess moisture or dripping. For those remaining stubborn drops, use a hair dryer or portable fan. Some lamp shades are made of delicate fabric or have ornate trims that prevents them from being submerged in water. In these cases, whip together the solution of warm water and detergent in a large bowl until it foams. Apply this bubbly mixture to the shade using a sponge. Rinse the shade using a similar method, but with a clean, wet sponge. Let the shade air dry completely before re-attaching it to the lamp. 1. Maintaining your lamp shades on a day to day basis while ensure that you only have to give them a thorough cleaning once a year or so. Next time you’re cleaning up around the house, give your shades a light dusting—or even better, use the duster attachment on your vacuum to get rid of stubborn dirt. 2. 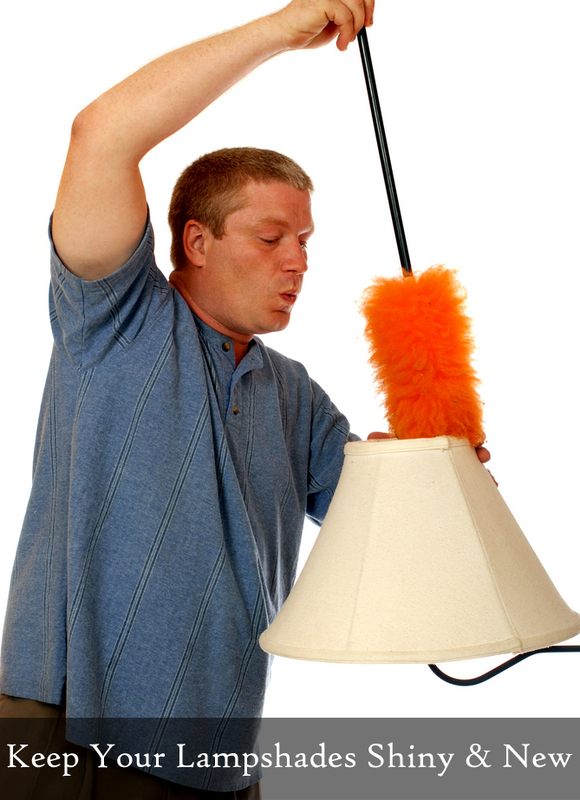 Plastic or glass lamp shades can be cleaned with a regular microfiber cloth. 3. Lamp shades that are glued to their frames (instead of sewn) should only ever be dry-cleaned.